If you’re looking for work this summer, you might just want to go to Maine. Changes to the federal immigration laws that govern the ability of foreign workers to come to America and obtain seasonal employment have created a kind of labor shortage for cooks, waiters, bike shop workers, and other job staples during the Maine summer tourist season. The laws permit 33,000 people to obtain visa to do seasonal work in the United States, but the way in which those workers are counted has changed. Before, returning workers weren’t counted toward that 33,000 number; now they are. As a result, the 33,000 ceiling has already been reached, primarily by hiring in the southern states. Maine, where the season won’t really begin for a month or so, gets the short end of the stick. Will the Maine businesses that used to hire foreign workers just close up shop? No, of course not — because it’s not a real labor shortage until the entrepreneurs that run those businesses try to address the issue through other means. If foreign workers aren’t available, maybe something can be done to attract non-foreign workers to fill the open jobs. So Maine businesses are looking at offering higher wages, flexible work schedules that might be appealing to older workers, and other approaches that will allow them to get the jobs done with locals. It’s a classic example of the law of supply and demand and the invisible hand at work (pun intended). Of course, Maine’s elected representatives are attempting to change the law to reinstitute the exception for returning workers that will allow more foreign hiring to occur, because for local businesses it’s no doubt cheaper and easier to hire those workers than it is to recruit, train, and deal with locals who might be more demanding about pay and hours and other job conditions. But for now, at least, opportunity can be found in Maine, if you’re a kid, or a retiree, who’s willing to serve up lobster rolls or work in a bike shop or serve as a deck hand on a tour boat in order to put some extra dollars in your pocket. As someone who left Columbus, Ohio and spent a wonderful summer working at the Alpine Village resort in Lake George, New York in 1976 — an experience you can read about here and here — I don’t think changes in our federal immigration laws that incentivize businesses to hire local teenagers and seniors for summer jobs is a bad thing. If the changes open the way for more American kids to get used to the concept of holding down a job, keeping the boss happy, earning a paycheck, and putting money in the bank, that’s a good thing in my book. Most of us remember our first jobs. Whether it was working at a pizza joint or a grocery store, a lifeguard station or a clothing outlet, flipping burgers or mopping floors or stocking shelves, there were many common experiences. We remember our parents encouraging us to find work for the summer. We remember applying for positions and getting hired. We remember our bosses and co-workers, and getting our first paychecks, and how good it felt to have some extra money in our pockets. Along the way, we learned some valuable lessons. We learned that being on time was important, unless you wanted the manager to chew you out. We learned that, whatever our parents said, the world didn’t revolve around us, and our bosses and co-workers didn’t think we were anything special. We learned to listen, take instruction, bite our tongues now and then, and do the work as we were told. We learned what makes a good boss and what makes a bad boss, and that lazy co-workers who always wanted you to cover for them were a pain in the posterior, that our co-workers who didn’t live in our neighborhood or go to our schools were nice people, and that a kind word from an appreciative customer could be a beautiful thing. All of these are reasons why I fear that our never-ending recession will have lasting consequences — for there are many teenagers and young adults who have been unable to land that first job and learn those valuable life lessons that have served the rest of us so well. Instead of working at those first jobs, they’ve been sitting at home, listening to their parents tell them how great they are and that it isn’t their fault that no jobs are available. When they finally do get that first job — whenever that might be — how well equipped will they be to succeed, without those memorable first job experiences to fall back on? When Kish and I were in upstate New York in June, we decided to visit Alpine Village, the memorable Lake George resort where I worked during the summer of 1976. I’m glad we visited, because it brought back some memories — but it made me sad at the same time. 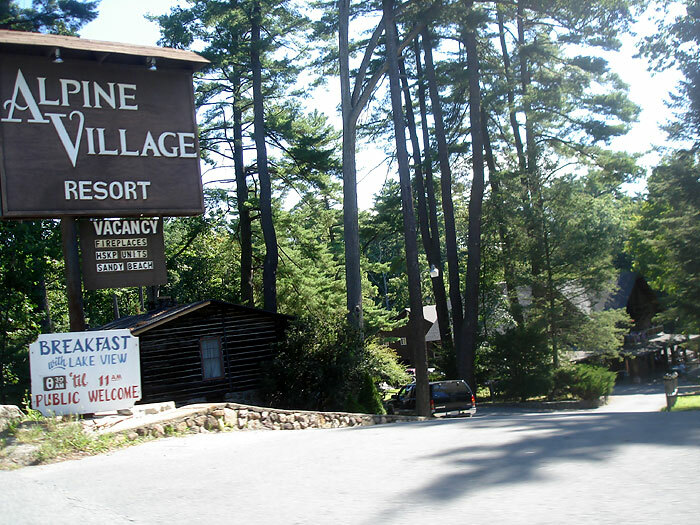 I’m happy to report that Alpine Village is still there, ready to provide a great vacation to anyone who visits Lake George. The resort is owned and operated by an energetic man who refurbished the main lobby pictured here, gave us a tour, and filled us in on fires, new buildings, and other developments in the 35 years since I’d last been there. A lot has changed,and two changes in particular saddened me. First, the long tables where guests used to sit for communal meals are gone. Today’s guests simply will not sit with strangers; they insist on dining at their own tables — and, I think, living in their own, imperturbable worlds. To me, the elimination of communal meals on the “American plan” eliminates some of the adventure in an Alpine Village vacation, and also reaffirms how Americans continue to withdraw from socializing with their fellow citizens. This retreat is part of a fundamental change in a people who used to routinely join every imaginable social organization. (Read de Tocqueville’s Democracy in America if you don’t believe me.) I don’t think this is a good development. Second, when I told the proprietor how much I loved working in the dishwashing room, he shook his head sadly and said that he couldn’t find any American kids who were willing to do that job anymore. The only applicants were immigrants who wanted to wash dishes as a second job. Have our kids really gotten to the point where they won’t take jobs that are hot and dirty, but yield a fair day’s pay for a fair day’s work? If so, I am sorry for them, for they are missing out on an experience that could help them grow and learn — and have some fun, besides. After a few weeks of washing dishes I got promoted to waiter. Alpine Village operated on the “American plan,” so guests got breakfast and dinner served at specified times and ate whatever our cook decided to prepare. The wait staff would carry in platters of scrambled eggs, meat loaf, pancakes, and Swiss steak and put them on the long, communal tables for everyone to share. The dining room usually was filled with lively chatter as the wait staff weaved in and out, dropping off fresh, hot plates of food and clearing the dirty dishes. 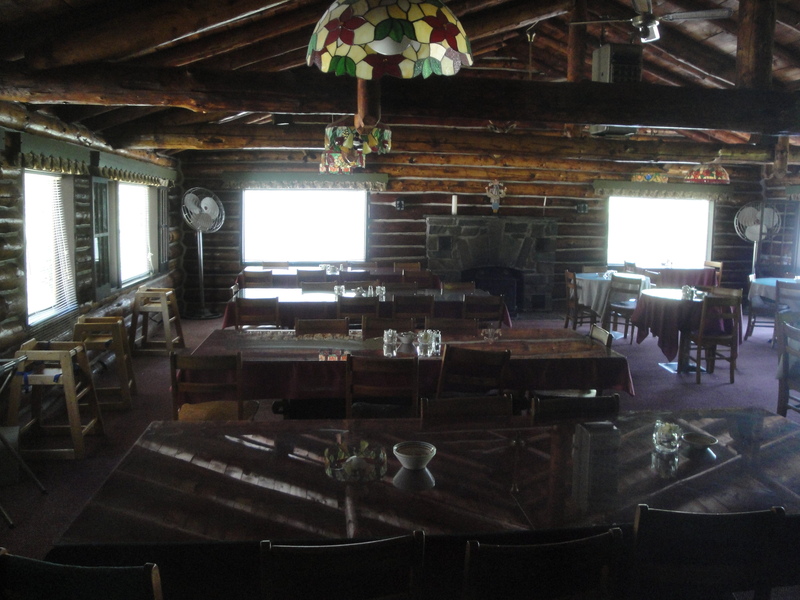 I also worked as a lunch-time short order cook, flipping burgers and making grilled cheese sandwiches and milkshakes at the “Rathskeller” in the basement of the main lodge, and as back-up bartender at that same location in the evening hours. For that summer, at least, I could make a tolerable Tom Collins or Harvey Wallbanger. The workday stretched from 6:30 a.m. sharp to 9 p.m. or so. When the day was over, the staff would party in the common area on the second floor of the barn, playing the Eagles and Jackson Browne albums on a battered communal stereo and drinking cases of beer, or take the Alpine Village speedboat across the lake to a local establishment that served ice-cold pitchers of beer and buckets of steamed clams. Few things taste quite so good after a long, hot workday as a cold beer in a frosted glass and a hot steamed clam dipped in drawn butter. I roomed with Jerry, the speedboat captain. He was a fun-loving, 30ish Vietnam War veteran who was primarily interested in testing the virtue of the bored mothers who spent the long weeks at Alpine Village with their spoiled kids, waiting for their husbands to come up from the City on weekends. My other great friends that wonderful summer were Sharon, the hilarious and acerbic bartender, and sharp-tongued Kate and good-hearted Ceal, who worked as waitresses and chambermaids. Our bosses were Marilyn and Peter, the chain-smoking, highball-guzzling married couple who owned the resort. There was no individual tipping at Alpine Village. Instead, guests would leave envelopes for the staff as a whole, and if they wanted to reward a particular employee they could designate part of the money for that person. We got the accumulated tips at the end of the summer. Peter and Marilyn did it that way to prevent reckless staffers from irresponsibly blowing their pay as the summer progressed — and they were right. I received several thousand dollars on my way out the door, which was a huge amount of money in those days. When I left Alpine Village at the end of that summer, with money in my pocket and a sense of self-confidence from having succeeded, on my own, in that faraway job, I felt like I had taken a long step toward becoming an adult. It was the summer of 1976. It was the year of the Bicentennial, the year after I graduated from high school, when the tall ships came to New York harbor and the Fourth of July was celebrated with a special, round-number, multiple-century vigor. 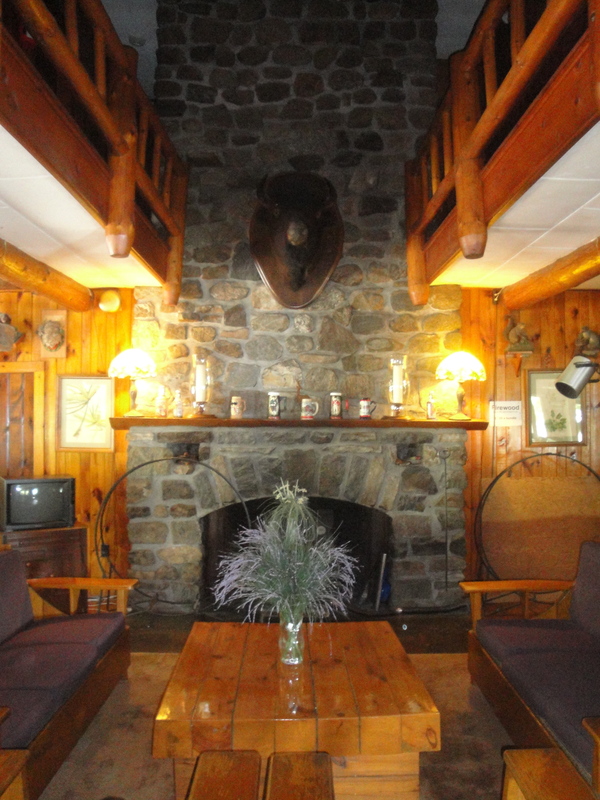 I spent that summer working at the Alpine Village resort in Lake George, New York. It was one of the best jobs I ever had. I wanted to get away from Columbus. I was looking for work at a resort-style place, where the position would include room and board so I wouldn’t have to pay for an apartment. Alpine Village was perfect. 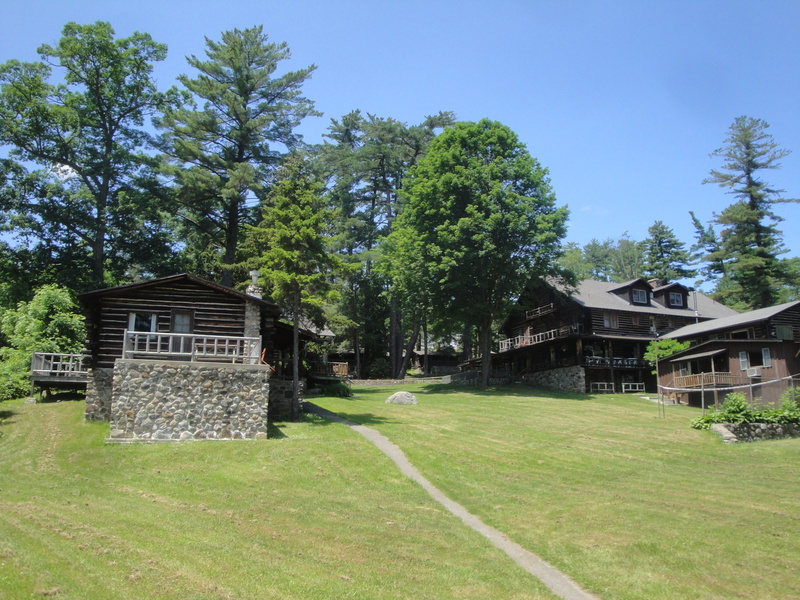 It was a small resort located right on Lake George that employed about 15 staffers who performed every imaginable job. Most of us — men and women, teenagers and twenty-somethings, clerks and blue-collar types — shared small rooms on the second floor of a barn-like structure on the grounds. We were supervised by Peter and Marilyn, the chain-smoking, highball-drinking, often feuding married couple that ran the place. I started the summer as the dishwasher, working in a small room with a huge steel dishwashing machine and a nozzle that fired superheated water. 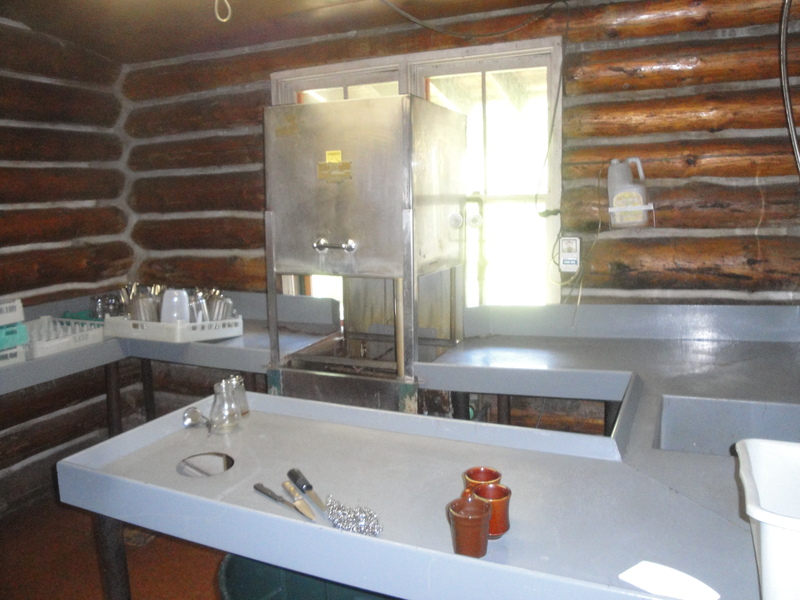 You rinsed the dirty plates with the nozzle, filled plastic racks with the rinsed dishes, slid the racks into the machine, closed the metal sheathing, and started the washing cycle. While the machine hummed away, you worked on the next stack of dirty dishes and glasses. When the machine was done you removed the cleaned rack amidst billowing clouds of scalding steam, slid in the next rack, started the process over again, and stacked the cleaned dishes, still hot to the touch, on the shelves. I loved working in that little room, managing things myself. During slack time, I cleaned and polished the steel counter where the dirty dishes were stacked and — best of all — practiced my skill at squirting streams of superheated water at doomed ants who couldn’t resist the scent of the leftover food. I worked with lightning speed in that steamy room, keeping the metal surfaces bright and gleaming, trying to keep ahead of the waitresses who dropped off the dirty plates and cutlery. Sure, I was working in a small room in a little-known resort in a small resort town — but what did I care? I was 19 years old, and on my own. Living in land-locked, lakeless Columbus, Ohio — with only the muddy, barely ankle-deep Olentangy and Scioto Rivers in the vicinity — Kish and I view every visit to a substantial body of water as an adventure. 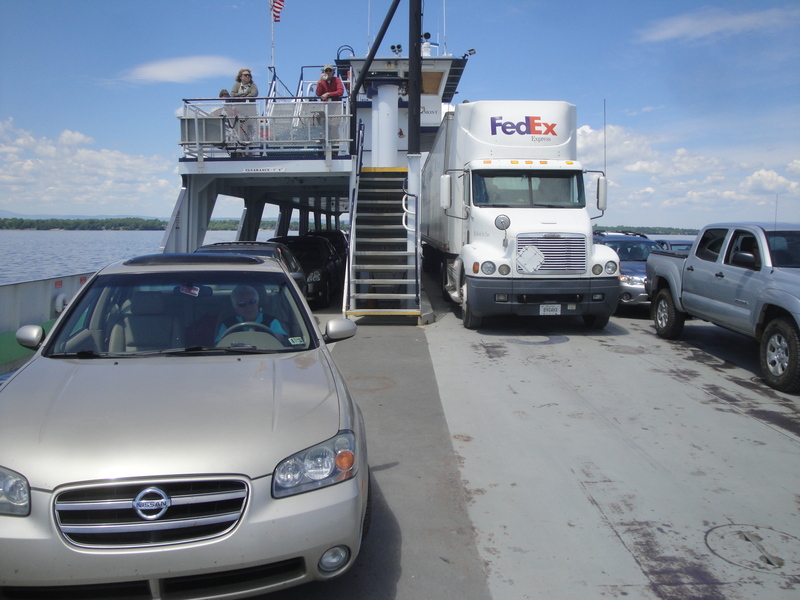 So it was with great anticipation that we looked forward to a trip on one of the ferries that cart passengers and cars across Lake Champlain, to and from various locations in Vermont and New York. Being Midwesterners, we were blissfully unaware that the rotten, wet weather of the spring was devastating for this region of the country. 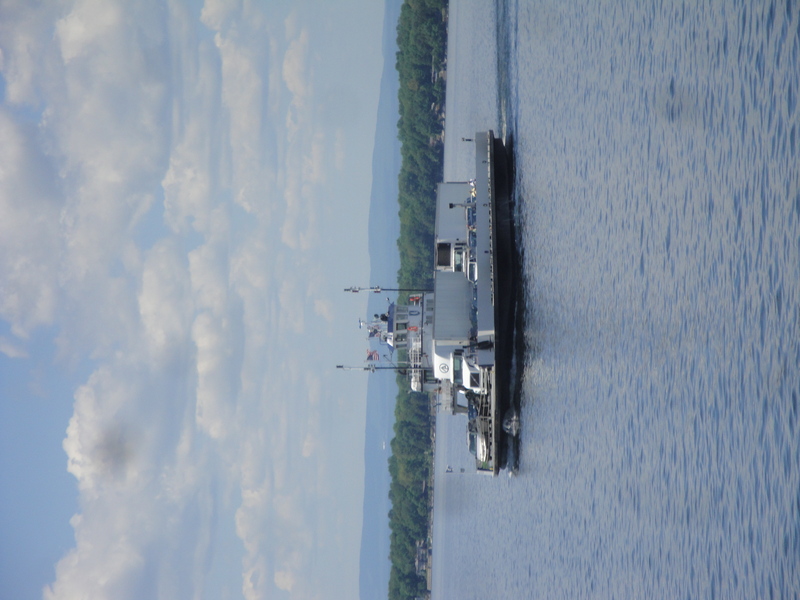 There was massive flooding along Lake Champlain and its environs, the signs of damages were ever-present as we drove along the lakeside, and even now one of the ferry runs is not operating due to the damage caused by the flooding. As a result, it took a while to find an operating ferry. Our second surprise came when we boarded the ferry and realized that, for everyone else on board, a trip across Lake Champlain on a ferry is a ho-hum, everyday, no-big-deal affair. Some people didn’t even leave their cars to admire the view on a beautiful, blue-sky afternoon, and we were the only “foot passengers” on board. It turns out that the ferries really aren’t a tourist attraction so much as a basic, hard-working element of commerce. The ferry ride we took was about 12 minutes in duration, and on our trip back and forth the ferry carried a tractor-trailer, a huge mobile home, and dozens of cars and motorcycles. The ship had a captain and two young crew members — probably college students home from school for the summer — who directed traffic and lowered and raised the gangplank that allowed cars to enter and exit. The passenger area was no-frills, with no snack bar or other amenities. There were three ferries in operation so that no one on either side of the lake had to wait more than 15 minutes for a ride, and they stuck to their schedule. In this part of the country, ferries and water-crossing jobs have been an important part of the economy for as long as people have lived here. For the captain and crew members who make dozens of trips across the lake every day, and for the occupants of the cars and trucks who regularly use the ferry, the romance of water travel has long since disappeared. What is exotic for us is just part of their daily routine. I posted recently on the impact of the recession on the summer job market for teenagers. Now USA Today has written a feature piece on the extent of the downturn in jobs for teenagers. Ten years ago, about half of all teens had jobs; this year it is only about 25 percent. The story notes that teens now are in competition for scarce jobs with older workers, immigrants, and former blue collar workers. In addition, increases to the minimum wage have hurt the number of jobs available for teenagers, and have had a disproportionately harsh impact on jobs for minority teens. One potential solution — a special, lower minimum wage for teenager workers — doesn’t seem to have much support in Congress. Whatever the cause, I think few would argue against the proposition that having a bunch of unemployed teenagers laying around this summer is not a good thing. Summer jobs provide crucial learning experiences for teenagers and help to ingrain habits of hard work and thrift. In addition, there is truth to the old adage that “idle hands are the devil’s workshop.” Teenagers who are working at a pool, a Dairy Queen, a golf course, a grocery store, or on a lawn crew don’t have as much time to be “bored” and engage in risky behavior with their friends. There has been a vigorous debate about whether increasing the minimum wage has been helpful or harmful. If the price of higher wages is fewer teenage jobs, I am not sure that it was a price worth paying.